AKA the best summer birthday cake. This cake has been a long time tradition for my fathers and sisters birthdays as they both celebrate in may. Originally the recipe is made with 'crema pasticcera' (custard), but now that my diet has changed so much I thought I'd try making a healthier version without sugar, milk or egg. Its also one of the simplest plant based cakes you can find, it just requires a little patience as you need to pre-soak the cashews and process them for quite some time. I honestly need so much self control or I would eat the whole entire thing in half an hour - I just love the creamy taste of vanilla and lemon mixed with the fresh berries. I know it might seem weird to use cashews but it's actually miraculously delicious and doesn't taste like cashews at all, but like custard! Leave the Cashews to soak for 4-6 hours in cold water. If you can’t find Medjool dates, which are the softest and sweetest, then buy normal dates but soak them in warm water for about 30mins first. Once it’s ready, get a cake tin line it with baking paper. Fill the tin with the dough with your fingers shape it into form. Place the tin into the freezer for about an hour in order for the crust to set and become nice and firm. In the mean time you can do the cream. Simply place the soaked cashews (drain them first! ), vanilla extract, sweetener, lemon juice and lemon zest into the mixer and blend until you get a nice smooth cream. Depending on your food processors strength this might take quite a while until it becomes really smooth like cream. 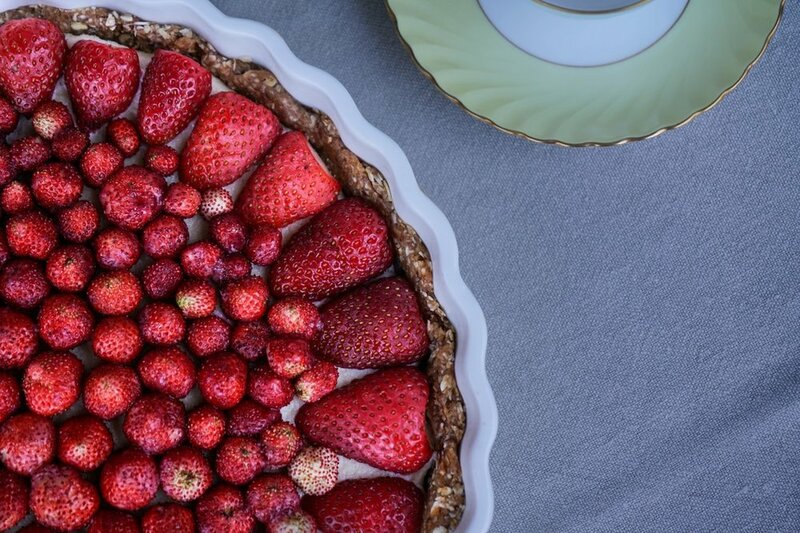 When it has reached the perfect texture fill the crust and even it out nicely, then place into the fridge for a few hours before topping with berries and serving. you can also make it into little tartlets like this for a tea party by using muffin tins and silicone moulds!